A favorite Bubbe recipe gets spiced up Millennial style with the addition of kimchi. If you're feeling industrious (and have a little patience), you even can make your own kimchi to use in the recipe. "Stuffed cabbage," writes The Gefilte Manifesto co-author Jeffrey Yoskowitz, "is traditionally associated with the holiday of Sukkot, which falls during the autumn harvest when cabbage is king. Because cabbage is so ubiquitous in the region, many Slavic cultures have a tradition of stuffing cabbage leaves. The Jewish version usually involves ground beef and rice, and sometimes sauerkraut, too. We’ve included both a meat stuffing and a vegetarian lentil mushroom variation in this recipe. Instead of kraut, we fold in our spicy Ashkenazi Kimchi to add an extra kick. Both versions of this recipe work great with sauerkraut, so feel free to substitute it wherever kimchi is indicated as an ingredient. You may need to drain the kimchi or sauerkraut in order to chop it, but reserve any excess brine and stir it into the sauce and filling. If using store-bought kimchi, we caution against purchasing only the spicy variety, which can be very, very hot. A mix of mild and spicy kimchi will balance perfectly with the added spice in this recipe. Note that this is a longer, more involved recipe." Excerpted from the book THE GEFILTE MANIFESTO by Jeffrey Yoskowitz & Liz Alpern. Copyright © 2016 by Gefilte Manifesto LLC. Reprinted with permission from Flatiron Books. All rights reserved. 1. TO MAKE THE SAUCE: In a medium saucepan over medium heat, heat enough oil to coat the bottom of the pan. Add the onions and sauté until they begin to turn translucent, about 5 minutes. Stir in the tomato paste to coat the onions and cook for about 2 minutes. Add the crushed tomatoes, pepper, brown sugar, vinegar, and paprika (if using) and cook at a low simmer, covered, for about 20 minutes. Remove from the heat, stir in the kimchi and any reserved brine, the lemon juice, and salt to taste. 2. To Make the Meat Filling: Pour the rice and water into a small saucepan and bring to a boil. Reduce the heat to maintain a simmer and cook for 5 minutes. Remove from the heat, drain through a fine-mesh strainer, and rinse with cold water. Set aside. In a skillet, heat the oil over medium heat. Add the beef and sauté, turning the meat over with a wooden spoon until evenly browned. Add the cooked rice, salt, pepper, paprika, and kimchi to the pan. Sauté for 2 minutes more, then transfer the mixture to a large bowl. Stir in the egg, bread crumbs, and any reserved kimchi brine. 3. To Make the Mushroom Lentil Filling: Pour the rice, lentils, and water into a small saucepan, and bring to a boil. Reduce the heat to maintain a simmer and cook for 10 minutes. Remove from the heat, drain through a fine-mesh strainer, and rinse with cold water. Set aside. In a skillet over medium heat, heat enough oil to coat the bottom of the pan. Add the onion and sauté, stirring frequently, until it starts to become translucent, about 5 minutes. Stir in the mushrooms and sauté until the mushrooms reabsorb some of their liquid, about 10 minutes. Add the cooked rice and lentils and stir in the kimchi, salt, paprika, eggs, and any reserved kimchi brine. 4. TO ASSEMBLE THE CABBAGE ROLLS: Bring a large soup pot of salted water to a boil. Remove the core of the cabbage with a long, sharp knife, very carefully cutting out a cone shape around the core and removing as large a chunk of the core as you can. This helps separate the leaves easily. Place the cabbage in the boiling water and cook for about 4 minutes. 5. Using tongs or two forks, remove the cabbage from the pot and carefully peel off any leaves that have become loose and translucent. Be careful and try to keep the leaves intact as best you can. Place the translucent leaves in a colander to drain, then return the cabbage to the pot and boil for 3 to 4 minutes more. Repeat the process until you have 12 large leaves. Pat the leaves dry with paper towels if still wet. 6. Preheat the oven to 300° F. Spread a layer of the sauce over the bottom of a large, high-walled oven-safe dish or a Dutch oven. Set aside. 7. Working with one leaf at a time, lay the leaf flat, rib side up, and use a paring knife to slice off the tough, raised part of the rib. Flip the leaf over and scoop 1 cup of the filling into the center. Try to keep the stuffing together in one clump. 8. Fold up the “bottom” of the leaf (where the core was attached) and lift it over the filling, about halfway up the cabbage leaf. While holding down the first fold with one hand, use the other to take the left side of the leaf and lay it over the first fold. Roll the leaf all the way to the right side and keep it tight. The top of the roll will be untucked. Push it down into the roll, forcing the top into the opening with your thumb or forefinger, which will form a tight little bundle. As you finish them, place the rolls into the baking dish, on top of the sauce. 9. Once all your rolls are in the baking dish, pour the remaining sauce over them. If there’s not enough sauce to cover them entirely, add water until the rolls are covered. Cover the baking dish with a lid or aluminum foil and bake for 2 to 3 hours. Check after 1 hour. If the rolls are no longer covered with liquid, add more water. Check again at the 2-hour mark and add more water, if necessary. 10. Stuffed cabbage is ready when the rolls feel completely soft when pressed with a finger (careful, they’re hot). Remove from the oven and serve immediately, or prepare up to 2 days in advance and reheat in the oven before serving. If reheating, just be sure the cabbage rolls are covered with liquid and do not dry out. 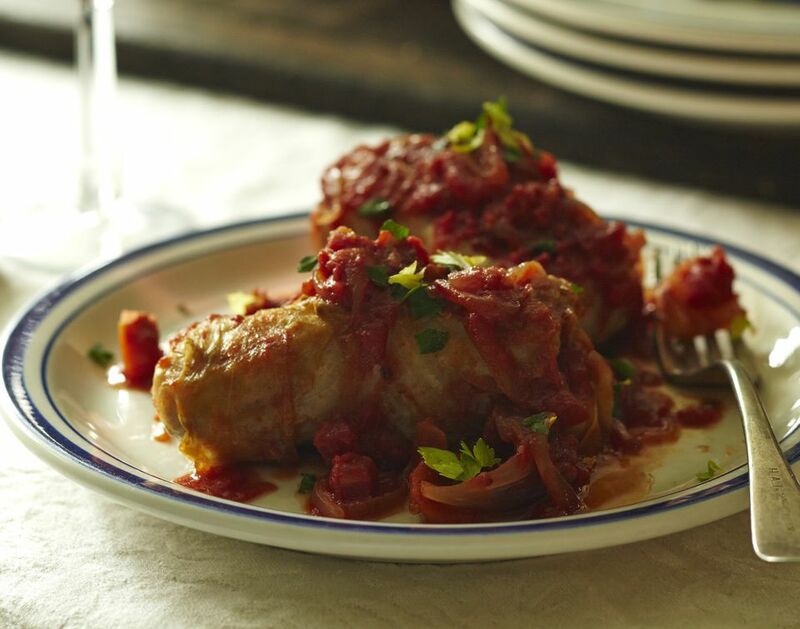 Serve the cabbage rolls hot, drizzled with extra sauce and garnished with parsley and celery leaves.